This is a countermovement. A new era of Sport Fashion. The Thunder takes an unconventional approach to design that disrupts and commands attention. It’s loud color-blocking, material mixes and bright accents. It packs the power of a storm. The Thunder pays homage to past collabs and silhouettes ahead of their time. 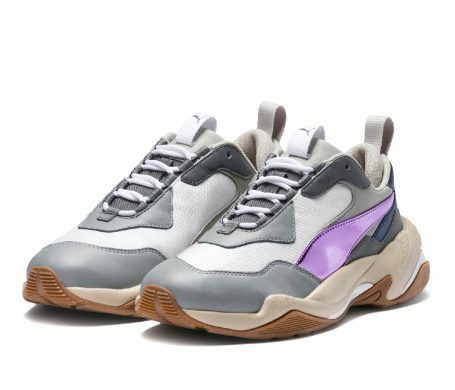 Inspired by 90s Cell System running silhouettes and the PUMA x McQueen collaboration, the style is a reimagined pair of kicks with a bulky, unapologetic look and feel. The exaggerated tooling, the blown-up proportions and the loud color blocking reserve a spot for the Thunder on the international runways and streets. Following the release of the Thunder Electric Men’s come a duo of new iterations in women’s sizes. The Thunder Electric Women retains the signature exaggerated design decked in nubuck leather and mesh overlays, this time with a softer colour palette with lavender hints and touches of chrome. Its design reflects the electrifying power of lightning. Dropping worldwide in selected sneaker boutiques, PUMA.com and PUMA stores on June 28th.